From impromptu campgrounds to exclusive charter flights, there are still a few places from which you can view the Aug. 21 solar eclipse. But the state of Oregon has some concerns about the expected massive influx of tourists. 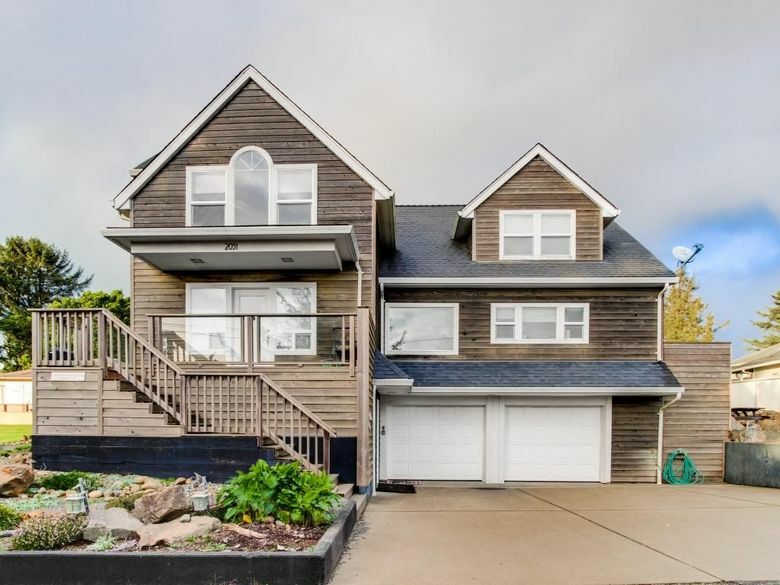 The HomeAway.com rental at Lincoln City, Oregon, sounds pretty enticing for a big, multifamily get-together to see the Aug. 21 solar eclipse. “Huge, luxury home w/game room, gourmet kitchen, space for 16,” shouts the online listing’s headline. “$668 per night,” it says. Hmm, kind of steep, but count those beds (can you say “par-TEEEE”?) and look at that location: Almost smack dab in the middle of the 62-mile-wide path of totality. And I know a guy who has an ordinary motel room booked in Bend — not even in “the path” — for $700 a night. So I plug in the dates, Aug. 20-22 — yes, it’s available! — but oops, the nightly rate jumps to $1,636. 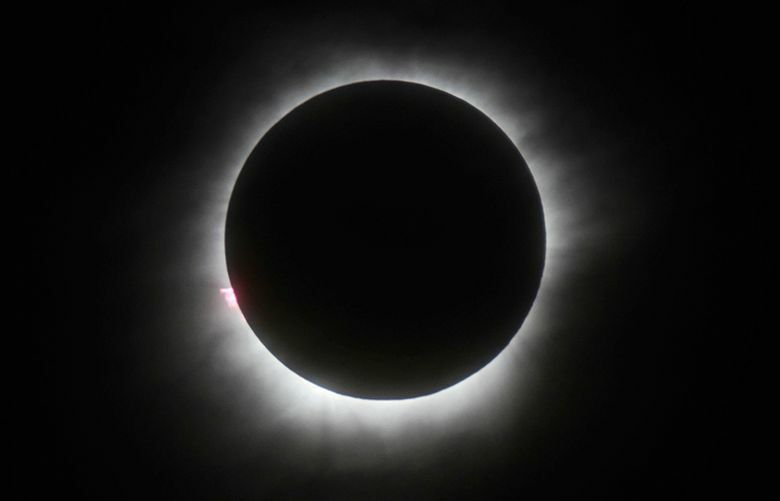 Such are the travails in recent days of looking for a place to stay if you wish to witness the full-on, path-of-totality solar eclipse that will cross Oregon and Idaho as it marches eastward across the United States. But if your heart’s set on it, options do remain. Maybe not at the beach, which is never really cheap. Move inland? I log on to the Travelocity search engine, click on the hotel icon and key in “Madras, Oregon,” for the same dates. Madras, I know, plans a big bash called Oregon Solarfest. Up pops a page with 74 listings for motels, cabins and lodges, covering an expanse from Madras to Sisters to Bend — taking in a wide swath of Central Oregon. The harsh reality: If you don’t already have lodging booked for the first full eclipse we’ve seen in the Pacific Northwest since 1979, your choices are squeaky tight. And, in many cases, outlandishly priced. This is an event made for home-sharing operations such as Airbnb and vacation-rental sites such as HomeAway. I log on to Airbnb and plug in Aug. 20-22 for Salem, Oregon, which is well within the totality zone — and a relatively quick cruise down Interstate 5 from Seattle. Up pop 20 photo images of rooms and houses, all with a “NEW” banner indicating that homeowners continue to step up to rent out their unused rec room or a kid’s old bedroom. Commonly, the listings have no reviews, suggesting these are Airbnb first-timers looking to cash in on the eclipse. 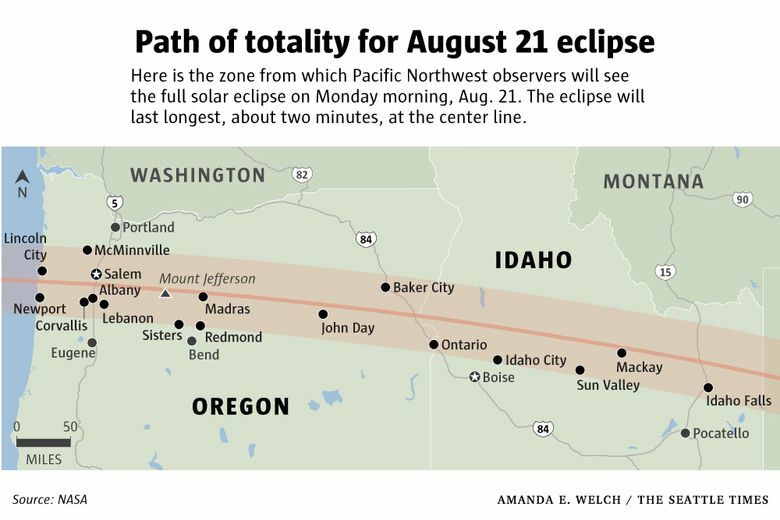 So why not just get a place outside the path and drive a ways to see the eclipse, which will peak across Oregon between 10:17 and 10:26 a.m. that Monday? That might not work if everybody tries it. Oregon state government is worried. That house on the coast was tempting, but will the coast be clear — or cloudy? 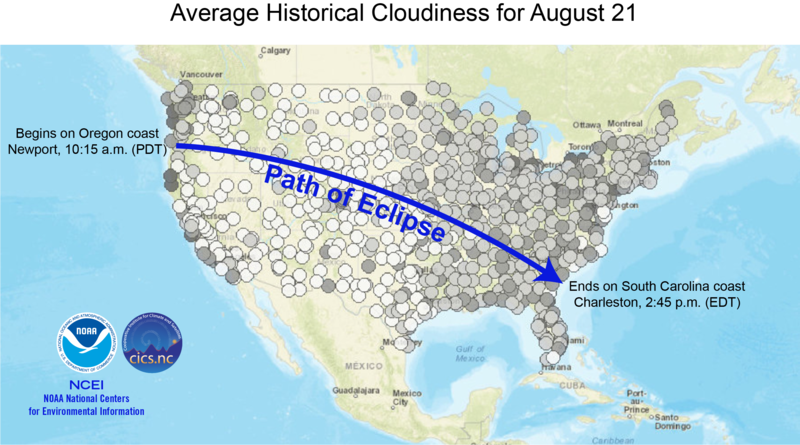 The National Oceanic and Atmospheric Administration has issued a map showing “Average Historical Cloudiness for August 21,” with an arrow showing the eclipse’s path across the United States. Bad news for coasties: The Oregon Coast is among the cloudier spots. So, if you’re a Pacific Northwesterner looking for the best eclipse view without having to drive more than a day, your best bet is to head east of the Cascades into sunnier Eastern Oregon or Southern Idaho. OK, let’s try Idaho. The totality path takes in Sun Valley, and this event is all about the sun, so there’s some karma there. This time I try Priceline, punch in Aug. 19-22 — and get exactly three offerings: all ritzy-looking condos, priced from $757 to $1,116 per night. Note: Like shadows moving across a lawn, this market is constantly changing. Your results may vary. You’re not made of money? You’re thinking of camping? Not likely if you’re hoping for a developed campsite in an Oregon state park or national forest. In the eclipse zone, everything that’s reservable is reserved. Oregon State Park campgrounds in the path of totality opened for eclipse-weekend reservations last November. They were gone in an hour. In the middle of the night. In April, state parks added another 1,000 sites, including 300 that are ordinarily first-come, first-served, plus 700 “dry camping” sites, typically in a field or parking lot with no water, no picnic table, and no fire pit. Those got snapped up in two minutes. If you don’t mind the crowds at Solarfest, as of a few days ago they still had 700 tent or RV spaces at what they’ve dubbed Solartown — a 5,000-site village, complete with 24-hour security (“unarmed and armed,” organizer Sandy Forman says), medic units, food vendors and more. Campsites start at $150 for five days. 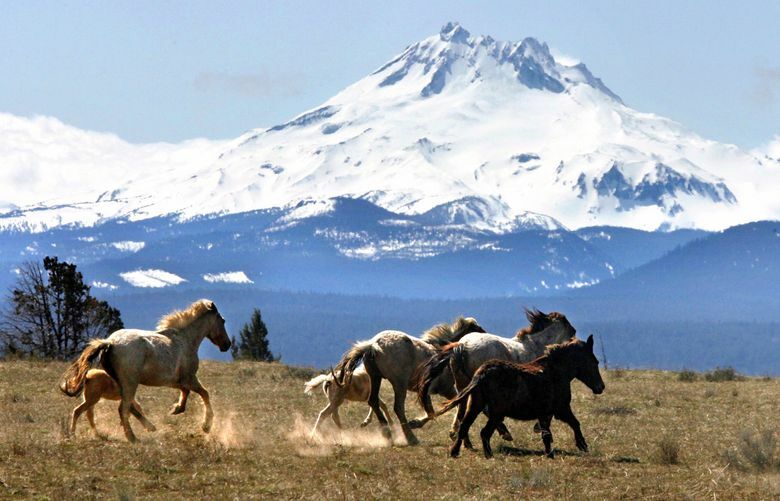 In Central Oregon’s Deschutes National Forest, all campsites that can be reserved online have been reserved already, but rangers suggest you keep checking recreation.gov for cancellations. National-forest campsites that remain first-come, first-served can typically be occupied for up to 14 days. Expect competition akin to the Oklahoma land rush two weeks before the eclipse. Jean Nelson-Dean, spokeswoman for the Bend-based Deschutes forest, suggests campgrounds in the Sisters Ranger District for best viewing. But the eclipse has nurtured the entrepreneurial spirit. There are grassy fields across Oregon where you can rent space for your RV or tent. 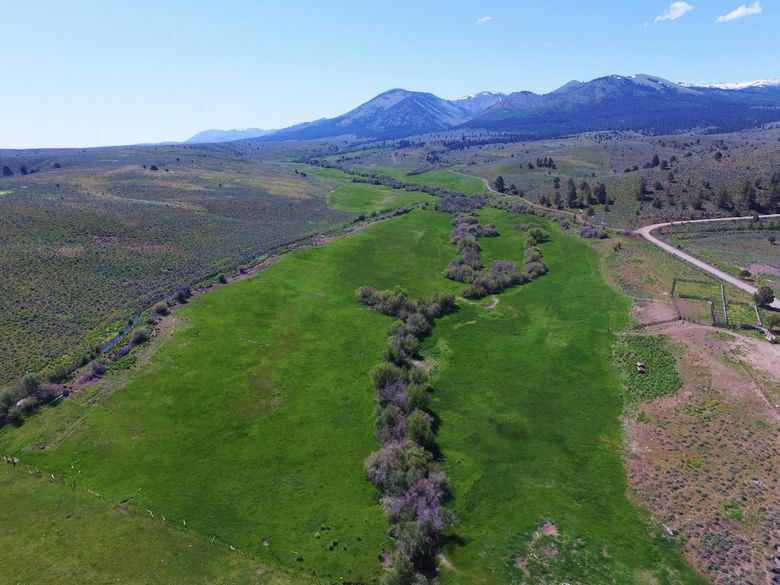 Three buddies from around La Grande — a glass artist, a Ford salesman and a custom contractor — rented a rancher’s lush pasture on Bull Run Creek, near the tiny burg of Unity, southwest of Baker City, for what they’ve dubbed Oregon Eclipse Camp, almost right on the totality centerline (oregoneclipsecamp.com). “Back in May we were waiting for that first phone call,” says Kevin Boylan, who doubles as a bartender when not blowing glass. Since then, about half of the 300-400 sites have been rented. They have options on up to 40 Porta Potties and four 1,000-gallon drinking-water tanks. The price for four nights: $249 for a tent site. The variety is endless, and Craigslist isn’t left out. I went on its Oregon site, entered “eclipse” in the search field and came up with 39 housing offerings. 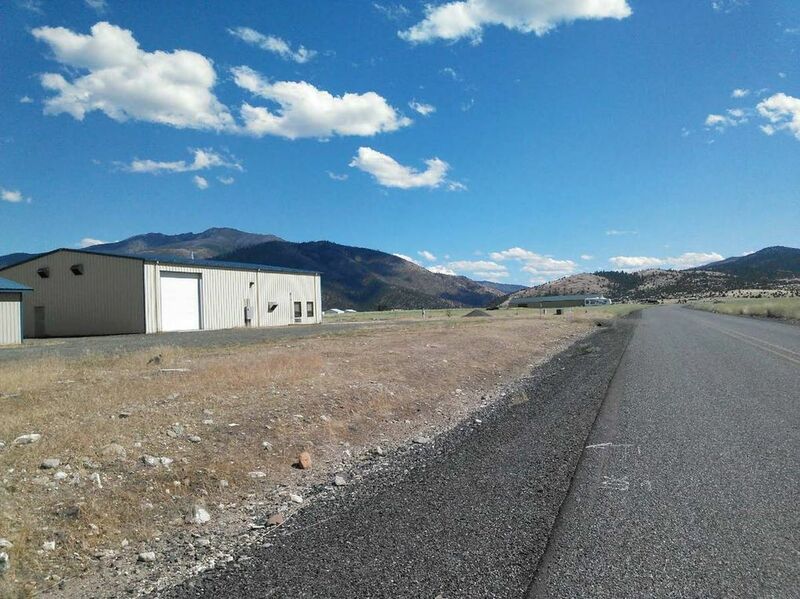 Near the town of John Day, I and 49 of my nearest and dearest could bunk down in a warehouse in an industrial park: Four nights for $5,000. Oregon’s Mount Jefferson, elevation 10,497 feet, is in the center of the totality path. Is that the place to be? “That’s a technical climb and we’re worried about people going up there who aren’t technical climbers,” says Nelson-Dean. She steers campers who don’t need a developed site toward Crooked River National Grassland, south of Madras. It’s flat, without a lot of trees to block your view. Don’t expect to be alone. Have all those details scared you off? Maybe stay above the fray: Enter Alaska Airlines’ contest to win two seats on its chartered, invitation-only eclipse flight for astronomy enthusiasts and eclipse chasers. It leaves Portland at 7:30 a.m. and heads off the coast to allow passengers to be among the first to witness the big event. The contest begins July 21 on the airline’s social-media channels. Sunny Central and Eastern Oregon expect to draw many West Coast eclipse chasers. The prospect of jammed roads, bare grocery shelves and gas lines loom large in the worries of the region’s small towns. Fire may be the biggest fear. She reminds motorists planning to camp in the rough that hot mufflers can easily set fire to dry brush and grasses. “It will also be lightning time, and the smallest spark here could set off a grass fire, which becomes a forest fire, which means evacuation” at a time when highways could already be gridlocked and emergency services taxed to the max. For emergency information during the eclipse in Central Oregon: coemergencyinfo.blogspot.com.